Cameron Whitman is a photographer specializing in food, stock, and event photography. If you’ve ever dismissed stock photography as being hokey and dumb, well, you’re mostly right. But Cameron has a unique and artistic perspective on what stock photography can be. You’ll learn a lot on how something you may think is extremely dull has so much creative potential. So learn not to pre-judge and instead find beauty in everything. 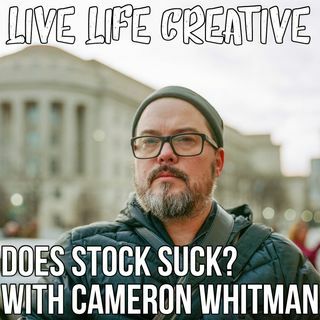 Talking with Cameron really shifted my own perspective on ... See More looking at the world and the potential of stock photography. An idea he’s talked about in the Cameras or Whatever podcast is that there needs to be stock photography of everything. If you’re into photography, I’d highly recommend the Cameras or Whatever podcast, it’s one of my favorites. Or search "Live Life Creative Podcast" on Facebook as well. As a note, Cameron's opinions are his own, and do not reflect the feelings or perspectives of Stocksy United. Remember to rate and review the podcast on whatever podcast app you're using! And tell a creative friend that they need to listen to it as well. Get them set up with a podcast app because not everyone knows what a podcast is or how to get them.